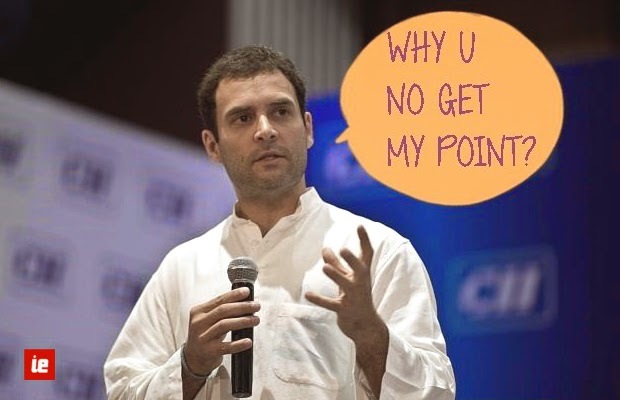 It is not an unknown fact that Rahul Gandhi does not know how to speak – to be specific “how to speak like a leader”. Whatever comes out of his mouth – it’s illegible and empty in substance. We have seen that happening in his public speeches and interviews. Most recently, in his interview with Arnab Goswami of Times Now. 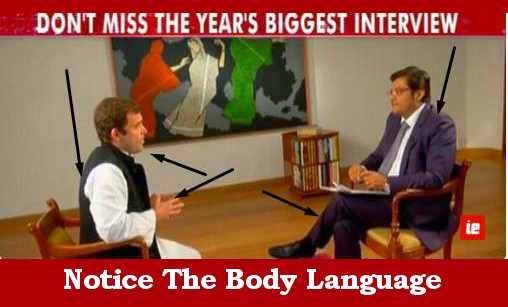 Though only Arnab would be able to tell if Rahul’s hands were sweaty when they shook at the end. Body language tells you a lot. And it can’t be emphasized enough that despite spending hundreds of crores on Japanese PR companies little has changed in terms of Rahul’s presentation. Yes, everybody saw a little vigor in AICC meeting – but even a slightest activity from his ends gets the media into a frenzy. The point is, not much is expected from him – everybody has learnt that overtime. To be fair, everybody is not born with a gift of gab – and if Rahul Gandhi can’t frame sentences properly, may be he can be excused. But only, had he tried to participate and perform in any kind of governance related activity. His same-aged colleagues like Jyotiraditya Scindiya and Naveen Jindal, have been party spokespersons and handling ministries at various levels. But Rahul never took even the minimal initiative to try his hand at any ministry. What’s up his sleeve is “his intra-party work”? How do you quantify that? Probably, only a loyalist like Sanjay Jha can justify that in rhetoric. His work (lack of) as a representative of his constituency isn’t unknown either. Recently, a newbie poet-turned-politician Kumar Vishwas embarrassed Rahul Gandhi in front of the whole country. I mean, the least you could do is to ensure that dalit could have received her promise house-repairs. And this was not even the first time “dalit-ki-jhopdi” was highlighted in media. All it took AAP volunteers, a few hundred rupees to get it fixed. All this tells you something, Rahul Gandhi hasn’t done even the most basic-minimal to claim his so-called “right to the seat”. He has had an extremely protected upbringing under his Italian mother (it’s well-known how protective Italian mothers can be towards their sons). And whatever his understanding is of the real-world is fantasy driven and very basic. No doubt he doesn’t have much substance to speak on. Substance comes from experience, not from custom-written speeches. To show on paper, Rahul Gandhi has no salable skills – not an orator, not a thinker, no body of work, no past experience in the governance, no performance to speak of, no understanding of Indian history, no real-life experience – the resume lands itself in the trash. How does one expect him to relate to the life of an average Indian? Only based on the legacy of a surname or beaten-to-death slogans? Very rightly he’s called ‘a prince’ – who is a default leader of Congress – not by capability, or even acceptance. Gandhi surname is all that is there. You can see him trying really hard, but failing. Rahul Gandhi is a 43-year-old man-child born with a golden spoon. People like Manishankar Iyyar and Manish Tiwari can keep fulfilling the debt of their loyalty to Gandhi parivaar in media by cooking up rhetoric. Congress has lived by the Gandhi family and will die by the Gandhi family. The genes of so-called “brilliance” have not passed on it seems. Everything that he does becomes news. Questions after question – about his capabilities, tweets after tweets – about his ridiculous utterances. It’s non-stop, because there’s nothing to speculate. His basic-minimal personality isn’t complex-enough like that of Modi or Kejriwal, where an angle can be explored. He is uni-dimensional. He’s not reluctant by choice – Rahul Gandhi has nothing to offer. You can only make as many jokes on someone. Come to think of it Rahul Gandhi is as pitiable as his predecessor Manmohan Singh. Dr Singh could not utter a word in his tenure, and Rahul isn’t even capable of it. PS: It’s completely all-right to be ordinary. But please don’t force an incapable leader on public. Matters of nation are above family names. Spending an extra Rs 400 Crore on PR won’t change the person inside. Let Rahul do something else. I personally would refer Sonia ji to the hit-movie ‘3 Idiots’. Please let your son choose his career, and stop trying to fulfill your dreams through him. And spare India the head-ache.